Home Lifestyle Sudden braking causes crash on busy road, but is it a scam? 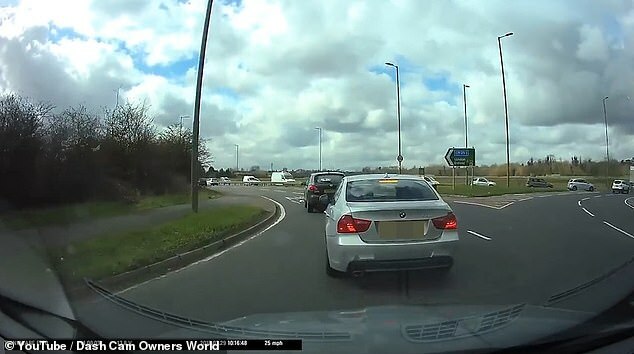 This dash-cam footage shows the moment a BMW suddenly hits the brakes at roundabout and the car behind slams into the back of it. The incident happened on the A10 near Waltham Cross, near London. 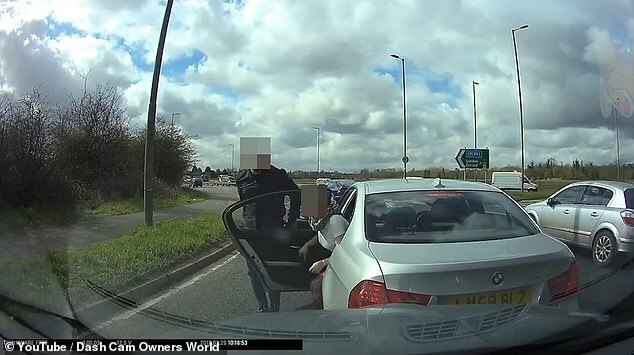 After the collision, captured on the car behind’s dashcam, two passengers get out of the BMW. They both stand in front of the dash-cam car while the woman remonstrates with the driver and the man holds his head. Meanwhile, the BMW, driven by a man in a baseball cap, drives off and pulls over at the side of the road. A man in baseball cap eventually gets out of the front passenger door, while another man gets out of the passenger door on the other side of the car. The man in the baseball cap, initially driving the vehicle, gets back into the car and doesn’t reappear as the man who got out of the car at the rear passenger door hovers nearby while the woman and man holding his neck have a discussion with the driver of the other vehicle. He pulls over his vehicle and gets out and can even be seen mimicking the action of a driver braking suddenly. The BMW is partly mounted on the pavement next to the road with the man wearing a baseball cap still inside. It is possible that he got out of the car on the front passenger side to avoid oncoming traffic. The video ends with the group and the individual deliberating with one another, the dash cam driver said they swapped details, seemingly to settle the dispute. The driver of the dash-cam vehicle explained his version of events in the caption for the video on YouTube, casting some doubt on the legitimacy of the crash. He claimed: ‘The driver for some unknown reason brakes to a complete stop. The driver in the frame wears a baseball cap and glasses.